World police body Interpol has issued an arrest warrant for ousted Libyan leader Moammar Qaddafi’s soccer-playing son, Al Saad al Qaddafi, for alleged crimes committed while he was head of the country's football federation. Interpol said Al Saadi, who earlier this month fled to Niger, was being sought at the request of the Transition National Council (TNC) "for allegedly misappropriating properties through force and armed intimidation when he headed the Libyan Football Federation." Interpol’s red notice demands that Al Saadi’s host country arrest him "with a view to returning him to Libya where an arrest warrant for him has been issued." The world police body noted that Mr. Qaddafi’s 38-year old son had also been a military commander involved in the brutal crackdown on anti-government demonstrators that sparked the United Nations no-fly zone and NATO intervention. Interpol said that Al Saadi’s assets had been frozen by the UN and that he was subject to a travel ban by the world body. The International Criminal Court in July issued arrest warrants for Mr. Qaddafi himself as well as his second son, Saif al Islam, and his intelligence chief Abdullah al Senoussi. Niger said earlier this month that it was willing to hand Al Saadi over to a third country but would not return him to Libya. "With regard to (our) international obligations, we cannot send someone back there where he has no chance of receiving a fair trial and where he could face the death penalty," Niger government spokesman Marou Amadou told Agence France Presse. "On the other hand, if this gentleman or any other person is wanted by an independent court ... which has universal competence over the crimes for which he is pursued, Niger will do its duty," he Mr. Amadou said. Al Saadi’s soccer ambitions and the brutality with which he exacted revenge for their expressions of dissent set Libya apart in the battled between Arab autocrats and football fans fought on soccer pitches across the Middle East and North Africa. Benghazi team Al Ahli played a heavy price for crossing Al Saadi, who not only headed the Libyan soccer federation but also owned the Benghazi team’s Tripoli namesake and arch rival in a country in which sports broadcasters at one point were forbidden to identify players by name to ensure that they did not become more popular than Mr. Qaddafi or Al Saadi, who also captained the Tripoli team. The story of Al Ahly stands out as a perverted twist of efforts by Middle Eastern leaders like Iranian and Iranian presidents Mahmud Ahmadinejad and Abdullah Ali Saleh and ousted Egyptian leader Hosni Mubarak to identify with their national soccer teams in a bid to boost their tarnished images. In a region in which the mosque and the soccer pitch were prior to the Arab revolt the only release valves for pent-up anger and frustration, Al Saadi’s association with Al Ahly (Tripoli) meant that the prestige of his father’s regime was on the line whenever the team played. As a result, soccer was as much a political match as it was a sports competition in which politics rather than performance often dictated the outcome. Backed by Al Saadi, Tripoli’s Al Ahly blossomed as a result of financial muscle that allowed it to buy the best players and bribe bully referees and linesmen to rule in its favor. A little more than a decade ago, Al Ahly fans had enough of Al saadi’s subversion of the game. They booed him and his team during a national cup final in front of visiting African dignitaries and dressed up a donkey in the colours of Tripoli’s Al Ahly. In response, Al Saadi went ballistic. “I will destroy your club! I will turn it into an owl's nest!” an irate Al Saadi told Khalifa Binsraiti, Al Ahly Benghazi’s then chairman, immediately after the match, according to The Los Angeles Times. Mr. Binsraiti was one of scores of Al Ahli Benghazi officials and fans who was subsequently arrested. A penalty in another Al Ahli Benghazi match against a team from Al-Baydah, the home town of Al Saadi’s mother and the place where this year’s first anti-government demonstrations against corruption in public housing were staged, again so outraged Benghazi fans that they invaded the pitch, forcing the game to be abandoned. Al Saadi penalized Al Ahli Benghazi by engineering the team’s relegation to the second division. The team was relegated after a referee in a match against Libyan premier league team Al Akhdar ensured Al Ahly’s humiliation by calling a questionable penalty. In response, Al Ahly’s coach confronted the referee, allegedly shoving him. Militant fans stormed the pitch. The game was suspended and Al Ahly’s fate was sealed. Al Ahly fans didn’t leave it at that. They headed to downtown Benghazi shouting slogans against Al Saadi, burning a likeness of his father and setting fire to the local branch of his national soccer federation. It did not take long for Libyan plainclothes security men to respond. Al Ahly’s 37-hectare clubhouse and facilities were raised to the ground as plainclothesmen visited the homes of protesting soccer fans. Some 80 were arrested of whom 30 for trial to Tripoli on charges of vandalism, destruction of public property and having contacts with Libyan dissidents abroad, a capital offense in Libya. Three people were sentenced to death, but their penalties were converted to life in prison by the Libyan rule. The three were released after serving five years in prison. Public outrage over the retaliation against Benghazi forced Al Saadi to resign as head of the national soccer federation, only to be reinstated by his father in response to the federation’s alleged claim that it needed his son as its leader. The brutal and demonstrative destruction of Al Ahly kick started Al Saadi junior’s inglorious attempts at making it in Italian soccer. Al Saadi signed up with the Maltese team Birkirkara, but never showed up. Three years later, he joined Italy’s Perugia but was suspended after only one game for failing a drug test. The incident earned him the reputation of being Italian Series A’s worst ever player. His dismal record did not stop him from enlisting in 2005 with Italy's Udinese team, where he was relegated to the role of bench warmer except for a 10-minute appearance in an unimportant late-season match. Libyans joke that Al Saadi is the only soccer player who paid to play rather than was paid to play. Libyan goalkeeper Samir Abboud says Al Saadi was incapable of passing a ball. The story of Al Saadi and the two Al Ahly teams is a study in the use of soccer by authoritarian Arab regimes to distract attention from economic and political problems and of Arab autocrats’ divide and rule approach to governance. It is also the untold story of soccer in a swath of land stretching from the Atlantic coast of Africa to the Gulf as a platform of resistance against repression, nepotism and corruption whose fighters graduated to the front lines once mass anti-government protests began sweeping the Middle East and North Africa. An earthquake rippled through the U.S. soccer community this past weekend. And it came in the form of the Egypt Football Association announcing that Bob Bradley will be the head coach of its national team. To be clear, the announcement wasn't the kind of massive upheaval that cracked foundations and sent institutions crumbling. It was more the type of tremor that shook you, made you sit up and take notice, and ponder the long-term ramifications. Call it a 6.0 on soccer's Richter scale. It's worth noting that from a purely historical perspective, Bradley isn't the first American to try his luck abroad with a foreign national team. In 1930, Mark Scott Thompson became the first U.S. coach to head up another country's national team when he took over El Salvador. Since the beginning of the new millennium, the likes of Bill Moravek managed the British Virgin Islands, Ian Mork took up the reins of Belize, while Steve Sampson had a two-year stint managing Costa Rica. But Bradley's appointment does signify a sizable shift. "Certainly, the status of Egypt as a soccer-playing nation is right up there," said Peter Wilt, who as general manager of the Chicago Fire, hired Bradley to his first professional head coaching job in 1998. 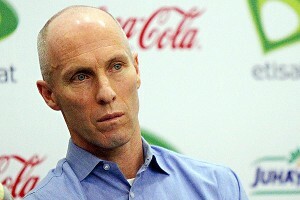 "Yet I think it's more important to recognize that an America-born coach can have the ability to lead a major country. I think it's an important step in gaining credibility for American soccer, not just American coaches, not just Bob Bradley, but the entire American soccer community. It's an important milestone, but it's one of many in the last decade." Just how big a marker it ends up being will depend on how Bradley performs. If he's successful, it may well open the door for other American coaches to get opportunities abroad. If not, the reputation of the U.S. will be knocked back down a peg or two, even as the sport continues its rise in terms of acceptance at home. But make no mistake, Bradley is walking into a job littered with challenges, some of which no other U.S. coach has ever encountered. From a purely soccer standpoint, an Egyptian side with a long history of success, one that included the last three African Cup of Nations titles, is undergoing a period of immense transition. Mainstays such as Wael Gomaa and Ahmed Hassan are heading toward the end of their international careers, and the Pharaohs didn't even qualify for the ACN next year to be held in Gabon and Equatorial Guinea. The Egyptian domestic league is in a state of flux as well, with clubs, many of which are owned by the military, attempting to move to a more independent economic model free of government subsidies. Yet that pales in comparison to the political upheaval that has wracked the country, and culminated in the ouster of long-time president Hosni Mubarak last February. The national team was oftentimes viewed as a public relations tool of the Mubarak government, and during the height of the protests the players and club management stood on the sidelines, much to the anger of fans. "There's a fair amount of work that's going to have to take place in order to rebuild the [national team] fan base, and also rebuild, in a sense, player confidence," said James M. Dorsey, who writes the soccer blog, The Turbulent World of Middle East Soccer. "You've had situations at the club level in which fans would unfold huge banners that said, 'We were there for you. Where were you when we needed you?'" Embattled Yemeni President Ali Abdullah Saleh’s meeting Sunday with his country’s national youth soccer team highlights the importance of soccer as a battlefield in the struggle between Arab autocrats and pro-democracy activists. Mr. Saleh congratulated team for their qualification for the 2011 Asian Football Confederation (AFC) Cup finals barely two days after returning to Yemen from three months of treatment in Saudi Arabia of severe wounds he suffered in an attack in June on his presidential compound by opposition forces. The Yemeni leader took time out to bask in the success of the squad in a bid to shore up his tattered image in a soccer-crazy country that is teetering on the brink of civil war as a result of sixth months of mass anti-government protests demanding his resignation from 33 years in office. He did so as troops commanded by his son attacked protesters and clashed with rebel army units in battles that raised the death toll of eight days of violence to more than 100 despite Mr. Saleh’s declaration of a ceasefire. Associating himself with one of the country’s greatest passions is part of Mr. Saleh’s survival strategy that involves as he announced in a televised speech on Sunday early presidential elections. Mr. Saleh’s proposal is unlikely to curry favor with his opponents who demand his immediate resignation, constitutional reform and only then elections. Mr. Saleh repeatedly agreed earlier this year to a Gulf-Cooperation Council (GCC) deal in which he would resign in exchange for immunity from prosecution only to back out at the last minute. In associating himself with soccer, Mr. Saleh is following in the footsteps of other Middle Eastern and North African autocrats, including the ousted leaders of Egypt and Libya and Iranian president Mahmoud Ahmadinejad who saw soccer as a way to boost their tarnished images. US embassy cables disclosed by Wikileaks detail the fuelling of nationalist emotions by Mr. Mubarak’s sons Gamal, who the president was believed to be grooming as his successor, and Alaa, to shore up the regime’s image after riots erupted in the wake of a crucial 2009 World Cup qualifier in which Algeria dashed Egypt’s hopes of playing in the tournament’s finals in South Africa. A November 25, 2009 cable said the only time Gamal displayed emotion during a presentation on healthcare was when he discussed the violence that took place in the Sudanese capital Khartoum where the match was played. A 2009 US cable describes how Mr. Ahmadinejad sought with limited success to associate himself with Iran’s national team and soccer’s popularity. The Iranian president went as far as in 2006 lifting the ban on women watching soccer matches in Iranian stadia, but in a rare public disagreement was overruled by Supreme Leader Ali Khamenei. The Iranian leader has also been hands-on in the management of the Iranian team. The cable reports that he pressured the Iranian football federation to lift its 2008 suspension of star Ali Karimi so that he could play in 2010 World Cup qualifiers, engineered the 2009 firing of Ali Daei as coach, ensured that Mr. Daei’s successor Mohamed Mayeli-Kohan lasted all of two weeks in the job and ultimately was succeeded by the president’s candidate, Afshin Ghotbi. Mr. Saleh heaped praise on the Yemeni youth team. “Your performance has been excellent. You have proved that the Yemeni sports are continuously developed and able to compete in the Arab, regional and international sports events" the president told them. He said that he had followed the team closely during his recovery in Saudi Arabia and that his government would fully support it. Mr. Saleh’s meeting with the soccer players echoes rifts in society and the game that emerged during the revolts in Egypt, Tunisia and Libya where managers and players often stayed on the side lines of the battle for greater freedom or even expressed support for the embattled leader. In Egypt, militant fans unfurled a banner during one of the first matches after Mr. Mubarak’s demise that read: "We followed you everywhere but in the hard times we didn't find you." Player and soccer manager attitudes towards the revolts in the Middle East and North Africa reflect a complex relationship of the ruled with the dictator that is evident across the region. It is an attitude that cannot be reduced to vested economic interest or privilege but constitutes an expression of the dictator’s success in getting those he rules to internalize his positioning as the nation’s father. It is that rupture of the internalization articulated in statements of protesters that they had broken the barrier of fear that constitutes the core of the region’s newly found people power. The internalization of the dictator as a father figure means that players and managers often support protesters’ demands for an end to corruption, greater transparency and more freedom, but object to the perceived indignity to which they see their leader or father as being subjected to. It is an attitude that resembles that of a child who defends his father irrespective of whether his father is right or wrong. Mr. Saleh’s focus on soccer highlights the struggle between autocrats and activists for control of the soccer pitch and the credibility that emanates from the one institution and venue that commands the kind of deep-seated passion evoked by religion in a conservative swath of land stretching from the Atlantic coast of Africa to the oil-rich sheikhdoms of the Gulf. For militant soccer fans, who emerged as soccer increasingly became a political football, wresting control of the pitch from autocratic regimes is a battle against the yoke of autocratic rule, economic mismanagement and corruption. It also signifies the quest for dignity; for national, ethnic and sectarian identity and women’s rights. Fans from Algeria to Iran have resisted the efforts by the region’s autocrats to politically control stadiums by repeatedly turning them into venues to express pent-up anger and frustration, assert national, ethnic and sectarian identity and demand women’s rights. “The battle is on the soccer pitch because there is no freedom and no political competition. Talking doesn’t change things. We fought for our rights in the stadium for four years. That prepared us for the day that the revolt against Mubarak erupted,” said Ahmad Fondu, a leader of militant, highly politicized, violence-prone soccer fans in Egypt. European champions FC Barcelona Saturday approved a controversial $225 million shirt sponsorship deal with Qatar Foundation, the first such a deal in the club’s illustrious history and the largest in soccer history. The club signed the five-and-a-half year deal, touted as the largest shirt sponsorship deal in football history, in December but the decision to collect money for the first time in its history to display a logo on its jerseys did not go down well. In a statement on its website, Barcelona said the assembly endorsed the deal with 697 votes against 76 and 36 abstentions. The Qatar Foundation, founded in 1995, funds education, scientific research and community development projects primarily in the Middle East. 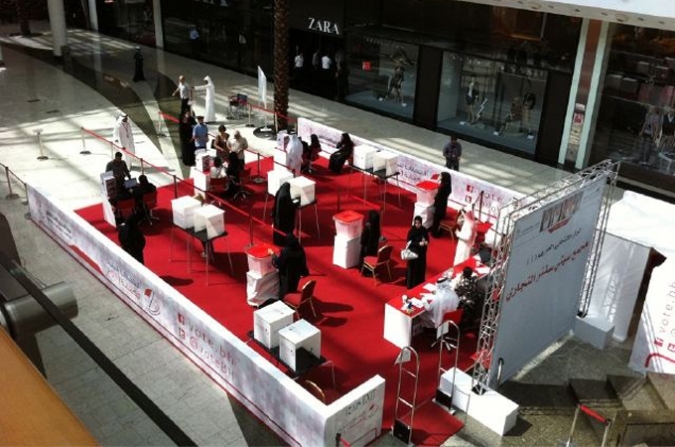 The non-profit organization is headed by the wife of Qatari emir Sheikh Hamad bin Khalifa al-Thani. Opponents of the shirt deal accused Qatar of being an autocratic state that has no opposition groups and has repeatedly postponed parliamentary elections. Countering critics Barcelona coach Pep Guardiola, who played for Qatar's Al Ahly from 2003 to 2005 expressed support for the deal, describing Qatar as "the most open Muslim country". "Qatar is opening up to the Western world and I know the efforts that the foundation is putting in to do some really good things. I think that we often don?t understand the Muslim world - nor they us," Mr. Guardiola said on Barcelona’s website. The deal comes as Barcelona is struggling financially. Barcelona posted a $107 million loss last season and has debts of $596 million. 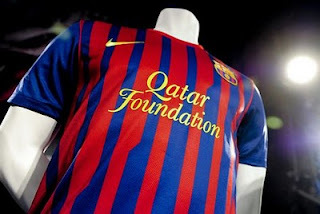 Barcelona vice president Javier Faus told members that the club's board felt it had no choice but to accept the shirt sponsorship because "it has a substantial economic impact". Mr. Faus noted however that the deal could be cancelled when the current board's mandate ends in three years’ time. "We wanted to solve financial questions but didn’t want the agreement to be irreversible," he said. World soccer body FIFA has banned Iraq from playing 2014 World Cup and 2012 Olympics qualifiers on home ground on Iraqi territory because of flaws in the country’s security arrangements. In a letter citing security concerns published on the website of the Asian Football Confederation (AFC), FIFA advised Iraq that it would have to play “until further notice” its home matches in a neutral venue. FIFA noted that "the security plan established by the local organizing committee (for Iraq's September 2 third round World Cup qualifier against Jordan in Arbil) did not meet the structural, technical, organizational and operational requirement specified in FIFA Safety Regulations." As a result, Iraq’s Brazilian coach Zico has to identify a neutral venue for its home qualifiers by early October. Iraq ranks third in Group A of the AFC's Brazil 2014 qualifiers with three points from two matches. Jordan and China are ahead of them while Singapore sits at the bottom of the group. Iraq’s next World Cup home matches are on October against China and February 29, 2012 against Iraq. Its coming Olympics qualifier is November 23 against Australia. The Middle East and North Africa are on the brink of risky sabre rattling that could erupt into armed conflict as the region's ten-month old wave of anti-government protests converges with stalled efforts to revive Israeli-Palestinian peace talks. Mr. Abbas’s request for United Nations Security Council recognition has put Palestine back on the agenda of both the international community and anti-government protesters. It has also put US credibility, US ability to influence events in the region and Washington’s relations with its closest allies on the line. The United States has vowed to veto recognition despite the fact that it has been unable to square the circle of a veto with President Barak Obama's public support for the creation of an independent Palestinian state alongside Israel and warnings by Arab leaders that a veto would substantially undermine US credibility and could affect relations with its closest Arab allies, among whom first and foremost Saudi Arabia. The diplomatic battle is likely to focus on buying time on the vote in a bid to allow for a revival of Israeli-Palestinian peace negotiations that would justify postponing a vote until the talks produce results or agreement is reached on the terms underlying UN recognition. In effect, by formally requesting Security Council recognition, Mr. Abbas hopes to have bought the Palestinians some leverage. Mr. Abbas has an interest in stepping up pressure on the United States to put its money where its mouth is but he like President Barak Obama and Israeli Prime Minister Benyamin Netanyahu does not want to see US credibility undermined to the degree that it no longer can act as the accepted mediator of an Israeli-Palestinian peace. By seeking Security Council recognition, Mr. Abbas has also earned brownie points by having put his Hamas rivals, who opposed his UN initiative, on the defensive – a fact that US and Israeli officials privately acknowledge but do not want to publicly acknowledge. Mr. Abbas’ strategy has already put efforts to break the stalemate in Israeli-Palestinian peace into high gear. The Middle East Quartet – the United States, the European Union Russia and the UN – called Friday for Israel and Palestine to meet within a month agree on an agenda for peace talks, table comprehensive peace proposals within three months, achieve substantial progress within six months and reach agreement by the end of next year. Nonetheless, Mr. Abbas’ strategy is not without risks. Mr. Abbas has yet to accept the Quartet’s proposal, which would effectively put his UN recognition bid on hold. He is likely to question the Quartet’s ability to enforce its timetable with Mr. Obama 13 months away from US presidential elections. Mr. Abbas has moreover said that he would only return to the negotiating table if Israel freezes the building of Jewish settlements on the West Bank and in East Jerusalem and agrees to the borders of the Palestinian state being based on the borders prior to the 1967 war in which Israel captured the two territories as well as the Gaza Strip. Israel is demanding talks without pre-conditions. The US elections mean that Mr. Obama is in no position to engage in the banging of heads needed to force Israelis and Palestinians into genuine negotiations that do not amount to a mere going through the motions and that would entail a bruising domestic battle with supporters of Israel. Mr. Abbas does not have 13 months. He will soon have to show some result to meet public expectations created by his request for recognition and prevent Hamas from being able to justify its rejection of his strategy. Mr. Abbas’ battle cry is likely to reverberate on the streets of Arab capitals where for much of the past ten months Palestine did not figure in mass anti-government protests but were never far from the surface. Protesters in Egypt, one of two Arab states that maintain diplomatic relations with Israel, earlier this month stormed the Israeli embassy in Cairo forcing diplomatic staff to be evacuated back to Israel. The pending Security Council vote coupled with a continued Israeli-Palestinian stalemate or peace talks that amount to motion without movement; deteriorating relations between Israel and its closest Muslim ally, Turkey; strains in the ties between the United States and Saudi Arabia; and the fact that embattled Arab leaders in Syria and Yemen would welcome a foreign policy distraction from popular demands for their resignation offers a perfect recipe for increased brinkmanship that could get out of control. Embattled presidents Bashar al Assad and Ali Abdullah Saleh, who this week returned to Yemen after months of treatment in Saudi Arabia for severe wounds he suffered in an attack on his presidential compound, have both accused foreign forces of instigating the protests that are rocking their regimes. Mr. Saleh’s surprise return to Yemen followed warnings by a prominent member of the Saudi royal family, former intelligence chief Prince Turk al-Faisal, that a US veto of UN recognition of Palestine could trigger reduced cooperation with the United States on resolving the crisis in Yemen and ensuring stability in Iraq. Messrs. Abbas and Netanyahu steered well clear of brinkmanship in their addresses on Friday to the UN General Assembly offering each other a hand or an olive branch. Yet, the likelihood that Security Council will not recognize Palestinian statehood any time soon coupled with an increasingly defiant and defensive mood in Israel hardly bodes well for the future. The sooner rather than later realization on the West Bank and in the Gaza Strip that Mr. Abbas’ UN initiative is not producing results could well signal the spread of the region’s protests to Palestine, pitting Palestinian demonstrators against Israeli security forces. Israel is already on alert in advance of the Jewish holiday season and a perceived threat from the Sinai that Jerusalem sees as an increasingly lawless territory where crime gangs, Palestinians and Al Qaeda sympathizers are able to operate with relative impunity. The storming of the Israeli embassy in Cairo was sparked by an incident earlier this month in which Israeli accidentally killed five Egyptian soldiers. Tension is also building on the high seas of the Eastern Mediterranean with Turkey warning that its navy will challenge Israel if it seeks to stop Gaza-bound aid ships in violation of Israel’s unilateral blockade of the Hamas-controlled strip. It has also warned Cyprus if it goes ahead with Israeli-backed oil exploration in disputed waters. Turkey earlier this month expelled the Israeli ambassador and froze all military cooperation after Israel refused to apologize for its stopping last year of a Turkish aid ship during which eight Turks and a Turkish-American national were killed. Turkey has further threatened to freeze relations with the European Union if Cyprus next year assumes as scheduled the EU presidency for a period of six months. All in all, there is no lack of flashpoints and sufficient interest across the region in escalating tension. To prevent increased brinkmanship from getting out of hand, progress in Israel-Palestinian peace talks is a sine qua non. The Quartet’s initiative may be a first step but with doubts that its tight timetable can be achieved it may at best temporarily delay escalation of tension in the Middle East but unlikely to pull it back from the brink. If there is one event or series of events or region that has fuelled the debate about the impact on policy and policymaking as well as on social movements and protest of technology in general and social media in particular, it is the Arab revolt that has been sweeping the Middle East and North Africa since December. Many have dubbed the popular revolts in Egypt and Tunisia the Facebook revolution. Indeed, in Syria social media and mobile telephony play a key role in circumventing news blackouts and censorship to get news of the brutal crackdown by the government of President Bashar al Assad to the outside world. 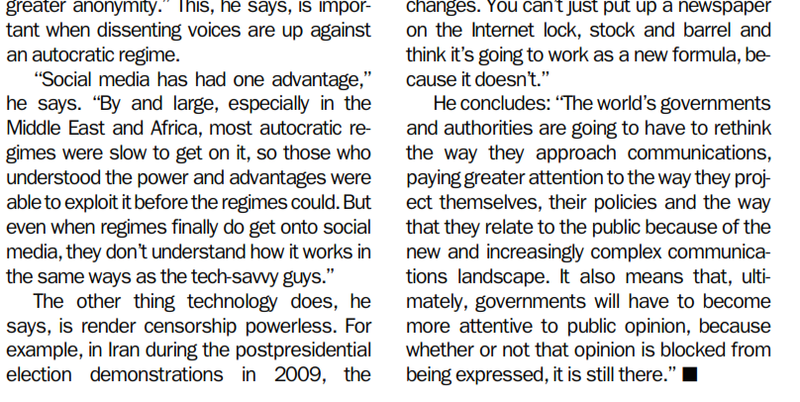 Yet, despite the perception of many, it is not technology that is sparking the revolts. No doubt technology helps, facilitates and accelerates the speed and breadth of communication. 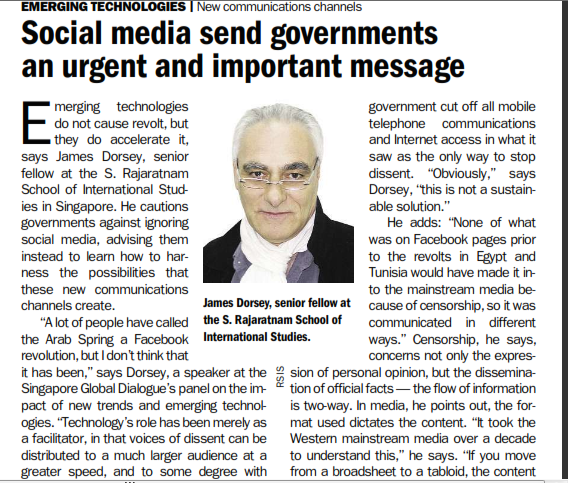 New technology and social media impact politics, social movements, communications and flow of news. But the question one has to ask oneself is whether the Arab revolt would have erupted without Facebook and I would think that the answer to that question is a resounding yes. To dub the Arab revolt a Facebook revolution would require revisiting our explanations and understanding of past revolts starting just over the last century Russia and moving on to Iran, the Philippines and for example Indonesia. To be sure, technology plays a role and indeed a very important role in protest and revolt. In Iran in 1979, it was the cassette that helped Ayatollah Khomeini to gain and wield power and inspire millions to overthrow the Shah, at the time one of the most powerful symbols of US influence in the region In the very initial phase of Tunisia in December it was the mobile phone video of a young many whose humiliation by the regime of President Zine el Abedine Ben Ali persuaded him to set himself on fire that sparked the protests that led to the president's downfall. Cassettes and mobile telephony are technologies that autocrats understand by and large. Social media, however, is in many ways a game changer, primarily because it involves a degree of engagement and connecting with one another that works in the favour of activists. Activists employ the medium at a time that autocrats have ignored it and failed to understand its power. Social media constituted and constitutes a window of opportunity for activists. 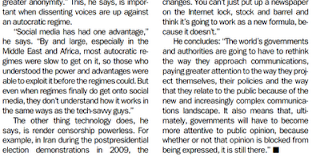 But even when autocrats attempt to engage, they are up against people who understand social media and its opportunities in ways autocrats have yet to grasp and structurally will find difficult if not impossible to grasp. Social media changes in ways earlier technologies did not the way one has to manage communications and public affairs, particularly in a crisis. That requires a degree of sophistication that many but particularly inflexible, ossified autocratic governments often find difficult, if not impossible, to marshal. In fact, marshaling that degree of sophistication would mean a far more far-reaching revision of the way most autocrats do business, a skill Arab autocrats certainly have yet to put on display. Perhaps most frustrating and most fundamental to autocrats is the fact that the combination of mobile telephony, the Internet and social media has rendered censorship futile. It fundamentally changes the ground rules of communications policies. It turns the shaping of the narrative into something much more complex, in which governments and institutions, autocratic or not have to engage in ways they did not have to in the past. For one communication has truly become a two-way street. Shaping the narrative no longer means control, instead it means engagement. And that is an approach that in the best of circumstances is a difficult one. That is certainly true for autocrats, particularly embattled ones. It requires a mind shift few autocrats, certainly those that are on the defensive, can easily make. Just how difficult that process is evident in the problems the Western media have had in adjusting to technological change. It took the media years to understand that format shapes content, that when several years ago broadsheets moved to tabloid formats, the nature of the story changed. Similarly, simply moving the print edition of newspapers lock, stock and barrel on to the Internet was not a workable formula. It failed to recognise changes in terms of interactivity and the way news is consumed and the changing expectations the public empowered by new technology has of what news organisations offer. As a result, governments and institutions irrespective of the political environment they operate in have to rethink the way they approach communications. They have to pay greater attention to the way they project themselves, their policies and the way that they relate to the public in a new and increasingly complex communications landscape. It also means that, ultimately, governments and institutions will have to become more attentive to public opinion, because whether or not that opinion is blocked from being expressed, it is still there. The world looked to the Arab street in the wake of 9/11 for change that would eradicate the feeding ground on which extremism feeds. When the Arab street did not come through, government officials, analysts and journalists wrote the Arab street off. Fact of the matter is, widespread discontent continued to simmer at the surface. One only needed to put one's ear to the ground. If the current Middle Eastern revolt or series of revolts and its embracement of technology teaches us anything, it is that where discontent exists but cannot be expressed openly, it will be expressed elsewhere in what constitutes a truer reflection of reality. It is a reality enhanced but not sparked by technology that one ignores at one’s peril. Thank you. 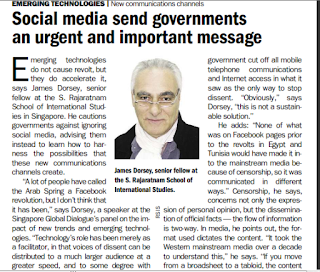 James M. Dorsey is a senior fellow at the S. Rajaratnam School of International Studies at Nanyang Technological University in Singapore. He also is the author of the blog, The Turbulent World of Middle East Soccer. Jordanian Prince Ali bin al Hussein, half-brother of King Abdullah, has called on Jordan and other governments to increase support for sports in general and soccer in particular in a bid to build community resilience against extremism. 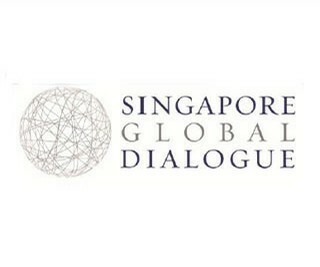 Prince Ali, a vice president of world soccer body FIFA and head of the West Asian and Jordanian soccer associations, issued his call in a video-taped address to the International Community Engagement Conference in Singapore organised by the International Center for Political Violence and Terrorism Research. The prince's remarks came amid a wave of mass anti-government protests sweeping the Middle East and North Africa in which militant soccer fans have played key roles. The protests have already toppled the autocratic leaders of Tunisia, Egypt and. Libya, left the embattled presidents of Syria and Yemen tottering on the brink of demise and prompted the monarchs of Morocco and Jordan to accelerate their plans for political and economic reform. Prince Ali was elected to the executive committees of FIFA and the Asian Football Confederation (AFC) in December of last year on a platform that called for youth development and empowerment of women. "Throughout my career in football...I have witnessed first-hand the power of this beautiful sport in engaging our youth, empowering local communities, and developing pride on the individual and national levels. This is the essence of building community resilience," Prince Ali said. “Extremism is a phenomenon that threatens our common humanity and constantly challenges our potential to develop and progress. It is anathema to the most basic human values that we must not only uphold but protect and promote; respect and dignity. This is where sports play a key role," the prince added. The prince argued that soccer "has the potential to transform lives especially if introduced and promoted at the grassroots level amongst our youth, which in turn, represent the majority of our population in Asia. Through Football, our youth experience the spirit of teamwork and fraternity, but also develop their own individuality by taking responsibility for their choices and actions toward their teammates and the opposing team on the field. There are rules and regulations to be respected and followed thereby instilling a sense of duty and respect towards others; increasing tolerance and promoting coexistence." To achieve that goal, Prince Ali said governments had a duty to build sports infrastructure in a bid to address the needs of the youth, empower boys and girls and create opportunity for them. "I have recently completed a tour of more than 22 sports club across Jordan in an effort to assess their needs. To my disappointment, the missing link in the football equation is the government." He argued that the Jordanian Football Association (JFA) was playing its part by focusing on community youth development projects such as youth centres and soccer academies and organising a national soccer championship for 500 teams representing their neighbourhoods across where children often do not have playgrounds Jordan. "I have seen the excitement of the players at the final game; they felt a sense of purpose and pride," Prince Ali said. The prince described professional Jordanian soccer players, many of whom graduated from JFA youth programs, as ambassadors in a game, he argued, strengthens relations "between nations and people of different cultures and backgrounds; thereby promoting respect, coexistence and acceptance. These values...constitute the building blocks of community resilience." 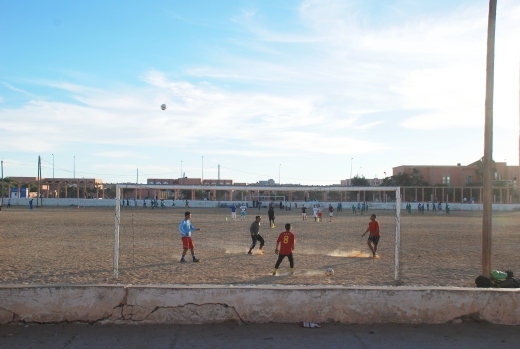 Prince Ali projected soccer as a "catalyst for social, cultural and economic development" and the building of "stronger communities based on respect, human dignity and coexistence. He vowed that the AFC would play a proactive role in promoting soccer programs that focus on education and holistic health for youth as well as the inclusion women. 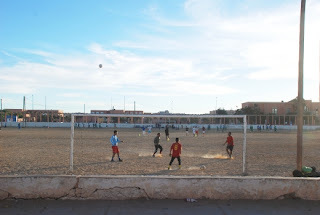 The women's issue as well as politics are likely to be litmus tests of Prince Ali's notions of soccer in terms of soccer as a catalyst for community building as well as for community engagement. The prince is quietly seeking to mediate a solution to FIFA rules that bar religious garb from the soccer pitch and as a result have excluded religious Muslim women players who want to wear the hijab, a Muslim hair dress that covers hair, ears and neck, from playing professional soccer. Equally difficult is the battle to reduce social prejudices in a conservative part of the world where the obstacles to women's participation range from social pressure to outright bans. Similarly, more independent ownership and management of soccer in a region in which regimes sought to control the game in a bid to improve tarnished images, distract attention from issues fuelling discontent, and prevent the pitch from a rally point for protest, is likely to be an increasingly prominent issue as change takes effect. World soccer body FIFA has appointed a committee to organize new Syrian Football Association (SFA) elections following the resignation of the group’s board and last month’s banning of the country’s national team from competing to qualify for the 2014 World Cup finals in Brazil. The committee has been tasked with organizing the elections by December 11. None of the SFA members that are part of the committee are entitled to stand in the election. The SFA board resigned after taking responsibility for the banning of the Syrian national team for fielding an ineligible player in two World Cup qualifiers against Tajikistan. 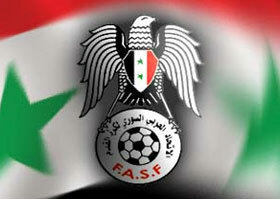 The Syrian Olympic Committee accepted the board’s resignation. Syria coach Nizar Mahrous quit after his team was disqualified. “Ihave lost the will and power to work after all that has happened. All the efforts we did have been wasted,” Mr Mahrous was quoted by the Syrian press as saying. The boards of both the SFA and the Olympic Committee are largely populated by people appointed with the approval of embattled Syrian president Bashar al-Assad. Mr. Assad and his regime face mounting international condemnation and economic sanctions for the brutality of its failed crackdown on six-month old mass anti-government protests. Some 2,600 people have so far been killed in the crackdown. The Olympic Committee accepted the SFA resignations after investigating SFA staff and players for allowing George Murad to play the matches against Tajikistan in violation of FIFA rules because he had been a member of Sweden Olympic team in 2003 and 2005. The investigation concluded that SFA staff was responsible for the FIFA violation that led to the banning of the Syrian team. Whether a newly elected SFA board will be independent or not is likely to depend on the state of affairs in Syria at the time of the election. Some 2,600 people have been killed in six months of mass anti-government protests that embattled president Bashar al Assad has failed to squash in a brutal crackdown. The protesters backed by US and European economic sanctions on Mr. Assad’s regime are demanding the president’s resignation. FIFA said earlier this month that it was monitoring events in Syria following the board’s resignation and the ban. FIFA was looking at whether a new SFA board is elected without political interference, which is hard if not impossible to achieve in a country that is wracked by civil strife and regime brutality in a bid to cling to power at whatever cost. THE Palestinian Authority is preparing to confront Israel's main ally, the United States, in the United Nations Security Council in a battle of wills over recognition of the Palestine state. This impending diplomatic clash will significantly undermine Washington's ability to protect its friend and could weaken its alliances in the Arab world. A decision by Palestinian President Mahmoud Abbas to request the Security Council rather than the UN General Assembly to recognise Palestinian statehood is designed to force the US to make good on its pledge to veto the resolution. The veto will significantly undermine US credibility and call into question President Barack Obama's support for the creation of a Palestinian state with borders based on the boundaries of Israel prior to the 1967 Arab-Israeli war, in which it conquered the West Bank, Gaza Strip and East Jerusalem. Mr Obama has vowed to block UN recognition of the Palestinian state, in support of Israel. He has argued that recognition would not further the Palestinian quest for statehood, and has set aside warnings from Arab nations that the veto would affect their relations with the US. The President clearly feels that he cannot afford a bruising domestic battle with Israel's supporters in the US, at a time when his ability to tackle the country's severe economic problems is in question and with presidential elections looming in just over a year. Mr Abbas, by dropping his initial plan to seek recognition by the General Assembly, has opted for a head-on challenge with the US that is designed to exploit the mood of public opinion in the Arab world, where popular revolts are fuelled in part by resentment at the impotence of their governments to effectively help Palestinians assert their rights. Arab states are under pressure to appear to back the Palestinians more aggressively after non-Arab Turkey set the tone earlier this month by expelling Israel's ambassador, downgrading diplomatic relations and suspending all military cooperation with it. In doing so, Mr Abbas is riding the popular wave that in Cairo led to the storming of the Israeli Embassy by militant, highly politicised soccer fans. Applying to the General Assembly would have allowed Mr Abbas to adopt a formula that would have avoided a head-on collision with Washington. He could have sought recognition of Palestine as a state that would not become a UN member. The US does not have a veto in the General Assembly, in which a majority endorses recognition of Palestinian statehood; also, its endorsement does not have to be approved by the Security Council as long as Palestine does not seek UN membership. In forcing Arab states to rally around his quest for statehood, Mr Abbas has thrown up a barrier to tacit efforts by Israel and the Gulf states to find common ground based on their eagerness to curb the tidal wave of anti-government protests sweeping the Middle East and North Africa, which have already toppled the leaders of Tunisia, Egypt and Libya and are shaking the foundations of autocratic regimes in Syria and Yemen. Both Israel and the Gulf states fear that the tidal wave threatens the existing order in the region and empowers the Arab street. Israel and the Gulf states also share concerns about Egypt's Sinai peninsula becoming a largely abandoned frontier for weapons smuggling and human trafficking, and that could become a launching pad for attacks on Israel alongside the Gaza Strip that is controlled by Hamas, the militant Palestinian Islamic group. Also, Israel and the Gulf states both view Iran as a major threat to regional stability; they do not want to see the Islamic republic succeed in its alleged efforts to develop nuclear weapons capability. All of that is secondary to the battle lines being drawn over Palestine. In a stark warning, Prince Turki al-Faisal, an influential member of the Saudi ruling family, warned that the kingdom will break with the US on Iraq, and perhaps on Afghanistan and Yemen, if the two countries were to go separate ways over this week's Palestinian bid for statehood. Prince Turki's remarks reflect a growing sense in Saudi Arabia that US support is as much a liability as it is an asset. To be sure, the US, Israel and the Gulf states share a host of common political and economic interests. Yet, the opportunity to capitalise on that commonality is shrinking at the very moment when they would benefit most from increased cooperation. UN recognition is likely be a largely symbolic victory, but it is one that could dramatically change the legal playing field on which the Israeli-Palestinian battle is fought. The writer is a senior fellow at the S. Rajaratnam School of International Studies, Nanyang Technological University.